Awesome tools, rules, and adventure content for every Dungeon Master. 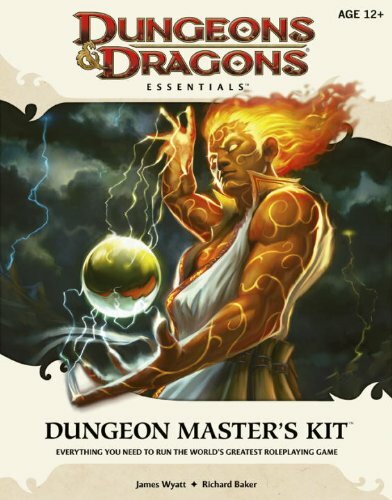 If you’re a Dungeons & Dragons player interested in taking on the role of the Dungeon Master, or if you’re an experienced DM looking for more game advice, tools, and adventure content, the Dungeon Master’s Kit™ has exactly what you need to build your own Dungeons & Dragons campaign and excite the imaginations of you and your players. This deluxe box contains rules and advice to help Dungeon Masters run games for adventurers of levels 1–30. It also includes useful DM tools such as a Dungeon Master’s screen (with tables and rules printed on the inside), die-cut terrain tiles and monster tokens, and fold-out battle maps. If you re a Dungeons & Dragons player interested in taking on the role of the Dungeon Master, or if you re an experienced DM looking for more game advice, tools, and adventure content, the Dungeon Master s Kit has exactly what you need to build your own Dungeons & Dragons campaign and excite the imaginations of you and your players. This deluxe box contains rules and advice to help Dungeon Masters run games for adventurers of levels 1 to 30. It also includes useful DM tools such as a Dungeon Master s screen (with tables and rules printed on the inside), die-cut terrain tiles and monster tokens, and fold-out battle maps.